The latest version of Picasa adds a nice new feature: it’s letting you use Google Earth to embed the geographical coordinates of where your pictures were taken. Geotagging used to be something that only GPS junkies did. 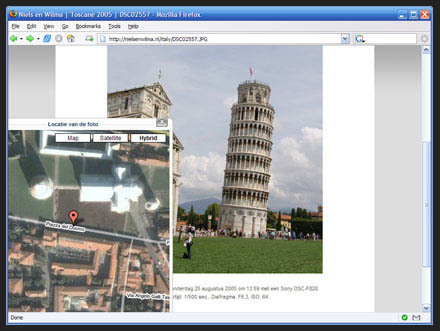 Determining the exact location of where pictures were taken and embedding that information into the picture itself, or using Flickr to tag the picture with the coordinates. Not everybody has a GPS device and even if you did how many of you used it to record the coordinates of where you took your pictures. Why would you want to geotag photos anyway? Sure, once you have geotagged a photo you can always read the coordinates and use a map or another GPS device to locate it again. Granted, it may not be useful for the leaning tower of Pisa – everybody knows how to find that one – but for pictures taken at a remote locations it is very useful. How many people remember exactly where they took that one particular picture 5 years ago. And if you publish your pictures on the web other people can even find that beautiful location that you found. Thanks to another Google Maps this get even easier: if you visit my personal photo gallery you can click on a button next to the photo and a map of the area appear. Google is now bringing geotagging to the rest of us. If you use Picasa and Google Earth you can easily add the geotagging information to all of your pictures. It is probably no coincidence that Google is adding this ability. The geotagging information embedded into pictures can be read by Google and used to improve the accuracy of its image search engine. Or it could lead to completely new ways to search. Imagine looking for images taken on a certain location. If you know the name of the location, Google Maps can already ‘geocode’ it to coordinates. And with those coordinates it could find any picture that was taken nearby. Imagine the internet as an enormous distributed database of pictures of every location on earth. It is actually quite simple. First you need to make sure that all the software that is required is installed on your system. 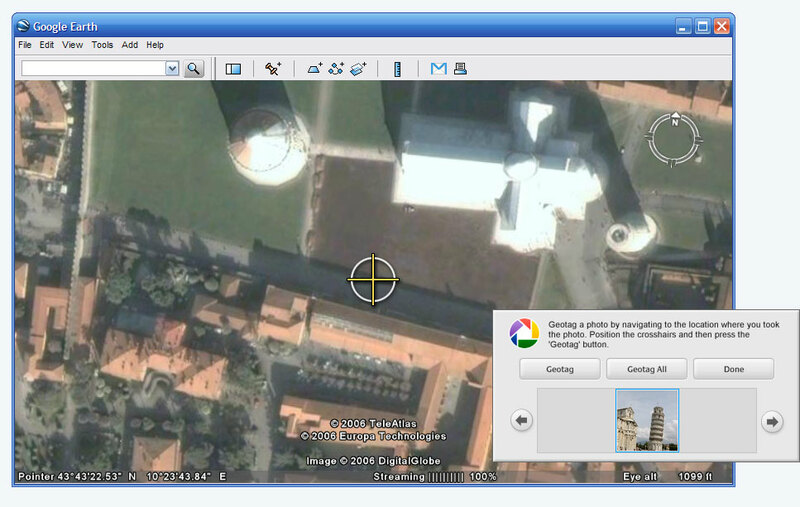 Geotagging is a new feature of Picasa 2.5, which is currently still in beta testing. If you are still using an older version you need to upgrade first. You also need Google Earth – I use the beta release of version 4, but it will probably also work in version 3 of Google Earth. 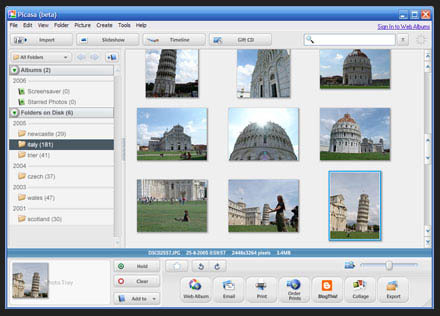 After importing your pictures into Picasa you are ready to do the actual geotagging. Simply select the picture – or pictures – that you want to geotag and go to the Tools menu. 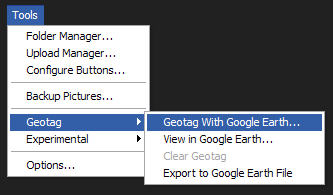 Select Geotag With Google Earth… from the Geotag submenu. 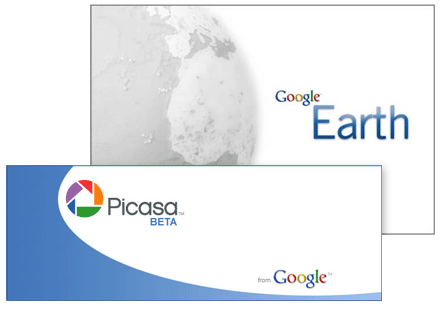 Google Earth will now launch and will work exactly the same as you are used to, except there will be crosshairs in the middle of the screen and on top of the Google Earth window there will be a small Picasa dialog that can be used to embed the geographical coordinates. 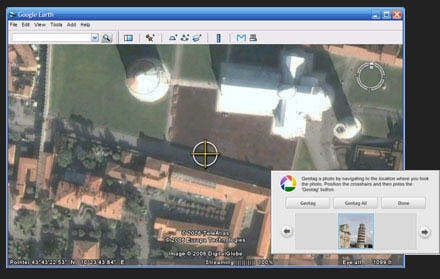 Simply look at the photo that is shown in the Picasa dialog and locate it in Google Earth. Zoom in and precisely place the crosshairs on the location where the picture was taken. If you are certain that the location is correct then click on the Geotag button. If you selected more than one photo you can now move on the next location. If all pictures were taken on the same location you could also have clicked on Geotag All. Click on the Done button if there aren’t any picture left in the Picasa dialog. You will now return to Picasa and your picture is geotagged. 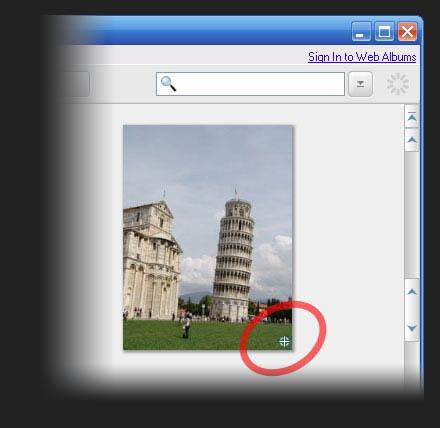 You can recognize pictures that are geotagged by the small crosshairs in the bottom right of the picture. Finally I uploaded the pictures to my personal photo gallery. I use Zenphoto for this purpose and by default it does not support reading of geotagging information. I’m quite handy in PHP, so I’ve written a patch for Zenphoto that reads the geotagging information and uses Google Maps to display the exact location of the photo. Genius, thanks for this. Would never have seen it otherwise. I am interested in your ZenPhoto patch. Is there anyway I could get the code from you? To further improve this the location should reverse geocode the co-ordinates and then embed this address into the file so that if I was looking for the name of the street that I knew the building to be on but not the building itself I would be able to search for that. Flickr lets you do all this without installing any software on your PC, and it’s been possible for a few years. You just click on a map, or type in a street address to place your photos geographically.